It’s Time to Fix Monroe! 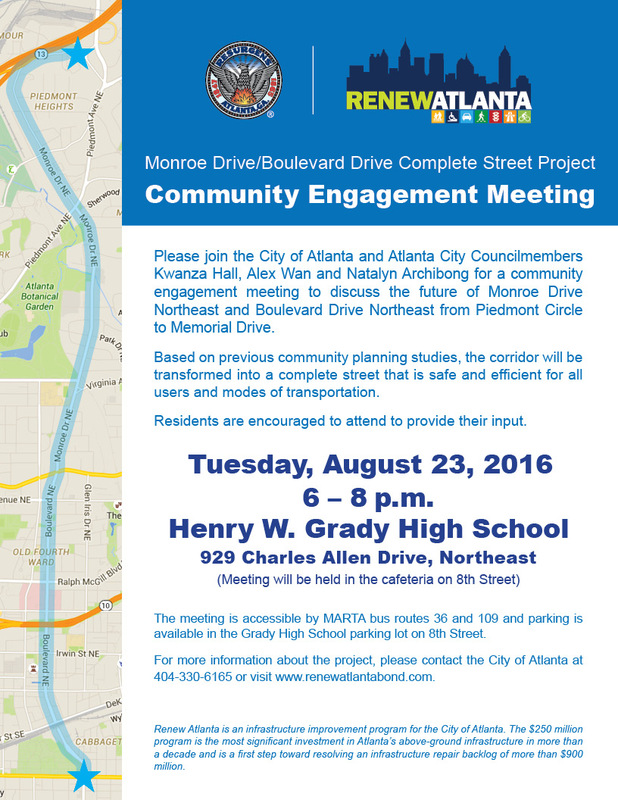 The City of Atlanta and City Councilmembers Kwanza Hall, Alex Wan and Natalyn Archibong will host a community engagement meeting next week to discuss the upcoming Monroe Dr./Bouevard Dr. Complete Street Project. The meeting will be held Tuesday, August 23, 2016, 6-8 pm, at Grady High School. See or click on the flyer at the bottom of this article for details. Following are comments from Jenifer Keenan, co-chair of the VHCA Safety Committee, regarding the proposed Complete Streets improvements for Monroe Dr.
Monroe is broken. It is above the state average in total crashes, fatalities and injuries for streets its size. It is unsafe, speeding is an issue, and at rush hour, traffic comes to a standstill. Fortunately, the City finally has a plan to address these issues. That plan is known as the Monroe Drive Complete Streets Project. The Complete Streets Plan will convert Monroe from two lanes in each direction to one lane in each direction with a dedicated turn lane in the middle. This part of the plan is known as a “road diet.” People may assume that removing a lane of traffic will make things worse on Monroe, but traffic engineering data and real life examples of road diets from throughout the country (including Atlanta) show that is not the case. Having a dedicated turn lane will prevent cars jockeying around drivers making left turns – and thereby allow traffic on the dedicated travel lane to move more smoothly – which can actually lead to a reduction in actual travel time along the street. Having traffic move more smoothly, as opposed to the stop and go that is caused by the lack of a dedicated turn lane, will also reduce cut through traffic on surrounding streets. In addition, road diets have been shown to significantly reduce collisions. The resulting benefits [or road diets] include a crash reduction of 19 to 47 percent, reduced vehicle speed differential, improved mobility and access by all road users, and integration of the roadway into surrounding uses that results in an enhanced quality of life. A key feature of a Road Diet is that it allows reclaimed space to be allocated for other uses, such as turn lanes, bus lanes, pedestrian refuge islands, bike lanes, sidewalks, bus shelters, parking or landscaping. Although many people are just now hearing about the Monroe Complete Streets project, the plan is not new. The City’s major transportation plans, including the BeltLine plan and the Connect Atlanta Plan, have called for a road diet for Monroe. The road diet was also supported in the Virginia-Highland Master Plan. Conventional wisdom is that road diets are most effective if streets carry less than 25,000 cars per day. Traffic studies have shown that the car volume on Monroe ranges from 19,000 – 22,000 cars per day. It is time to fix Monroe. The road diet, and other parts of the Complete Streets plan, are the best and most effective way to fix this broken street. This entry was posted in news and tagged 2016, completstreets, monroedrive, roaddiet by John Becker. Bookmark the permalink.